Babylonian amora of the second generation; grandson of Ḥana, the brother of Ḥiyya. He went to Palestine and became a pupil of R. Johanan, whose sayings he transmitted. Rabbah bar bar Ḥana (Rabbah bar Rabbah bar Ḥana) does not seem to have enjoyed high regard in his adopted country, for it was taken as a matter of course that R. Simeon b. Laḳish should not do him the honor of addressing him in public (Yoma 9b). After a somewhat prolonged sojourn in Palestine he returned to Babylonia, residing both at Pumbedita and at Sura. In the former city he at first refused to attend the lectures of R. Judah b. Ezekiel (Shab. 148a), but he soon became his friend, and was consulted by him in difficult cases (M. Ḳ. 17a). Judah and his pupil Rabbah b. Naḥmani once visited Rabbah, who was ill, and submitted a halakic question to him. While they were there a Zoroastrian priest ("geber") suddenly appeared and extinguished the lamp, the day being a festival of Ormuzd, on which Jews were forbidden to have fire in their houses (Grätz, "Gesch." 2d ed., iv. 292). Rabbah thereupon sorrowfully exclaimed: "O God, let us live either under Thy protection, or at least under the protection of the children of Esau" (the Romans; Giṭ. 16b-17a). The persecutions of the Babylonian Jews by the Sassanids caused Rabbah to resolve to return to Palestine (Pes. 51a), although it is nowhere said that he carried out that intention. During his residence at Sura he wished to introduce the recitation of the Decalogue into the daily prayer, but was dissuaded by R. Ḥisda (Ber. 12a). Later he visited Maḥoza, and he tells of the wonderful feats he saw performed there by a juggler (B. B. 73a, b; comp. Bacher, "Ag. Bab. Amor." p. 88, note 7, with Neubauer, "G. T." p. 398). Some haggadic sayings by Rabbah bar bar Ḥana have been preserved. He compares the Law to fire (Jer. xxiii. 29), in that as fire does not start of itself neither does the Law endure in solitary study (Ta'an. 7a). His interpretations of Prov. ix. 3, 14 and Isa. xxviii. 26 (see Sanh. 38a, 105a) also are noteworthy; his saying that "the soul of one pious man is worth the whole world" (Sanh. 103b) is especially memorable. Rabbah bar bar Ḥana's stories of his marvelous experiences during his voyages and his journeys through the desert have become famous. These accounts may be divided into two classes. In the first he records his observations, generally beginning with the words "I have seen." Among these are his remarks regarding the identity of the most fertile part of Palestine—"the land flowing with milk and honey" (Ket. 111b-112a); the distance between Jericho and Jerusalem (Yoma 39b); the area of the district in the plains of Moab mentioned in Num. xxxiii. 49 as the camp of the children of Israel (Yoma 75b); the castor-oil plant cultivated in Palestine, or the gourd of Jonah (Shab. 21a). Here also belong his accounts of his relations with the Arabs, one of whom once used a term which explained to him the word in Ps. lv. 23 (Ket. 72b, 75a; Yeb. 120b; R. H. 26b). 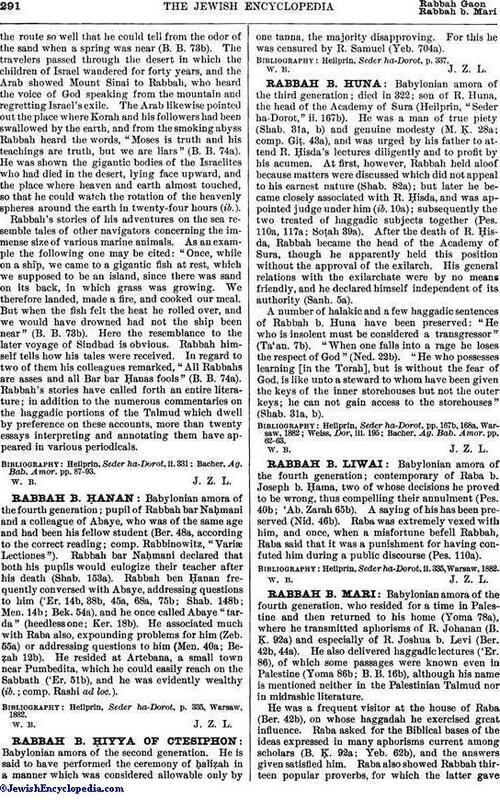 The other group of the narratives of Rabbah bar bar Ḥana includes his fantastic adventures on the sea and in the desert. In these stories one of the most conspicuous figures is the Arab who was the guide of Rabbah and his companions on their journey through the desert. This Arab knewthe route so well that he could tell from the odor of the sand when a spring was near (B. B. 73b). The travelers passed through the desert in which the children of Israel wandered for forty years, and the Arab showed Mount Sinai to Rabbah, who heard the voice of God speaking from the mountain and regretting Israel's exile. The Arab likewise pointed out the place where Korah and his followers had been swallowed by the earth, and from the smoking abyss Rabbah heard the words, "Moses is truth and his teachings are truth, but we are liars" (B. B. 74a). He was shown the gigantic bodies of the Israelites who had died in the desert, lying face upward, and the place where heaven and earth almost touched, so that he could watch the rotation of the heavenly spheres around the earth in twenty-four hours (ib.). Rabbah's stories of his adventures on the sea resemble tales of other navigators concerning the immense size of various marine animals. As an example the following one may be cited: "Once, while on a ship, we came to a gigantic fish at rest, which we supposed to be an island, since there was sand on its back, in which grass was growing. We therefore landed, made a fire, and cooked our meal. But when the fish felt the heat he rolled over, and we would have drowned had not the ship been near" (B. B. 73b). Here the resemblance to the later voyage of Sindbad is obvious. Rabbah himself tells how his tales were received. In regard to two of them his colleagues remarked, "All Rabbahs are asses and all Bar bar Ḥanas fools" (B. B. 74a). 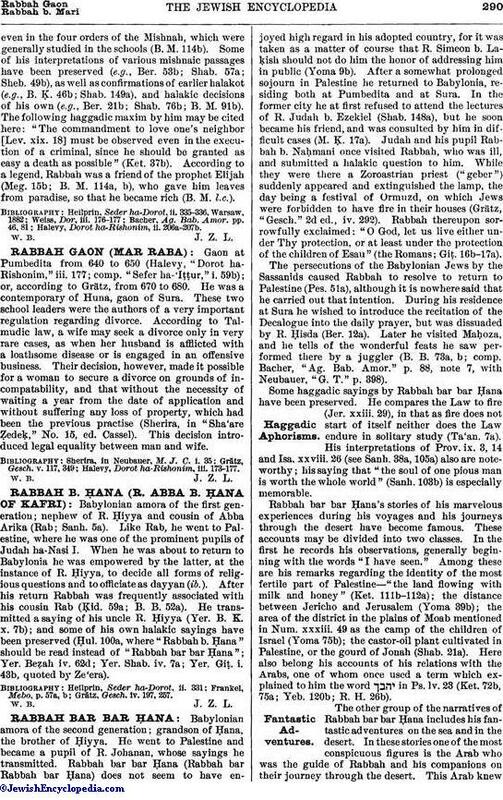 Rabbah's stories have called forth an entire literature; in addition to the numerous commentaries on the haggadic portions of the Talmud which dwell by preference on these accounts, more than twenty essays interpreting and annotating them have appeared in various periodicals. Bacher, Ag. Bab. Amor. pp. 87-93.